In small non-metal bowl, mix all dressing ingredients until well blended. Refrigerate. Rinse quinoa with cold water; drain well. In 2-quart saucepan, heat quinoa and 1 1/2 cups water to boiling. Reduce heat; cover and simmer 12 to 15 minutes or until tender. Drain; rinse with cold water to cool. Drain well. Place in large bowl. Meanwhile, chop bell pepper, cucumber, and scallions. 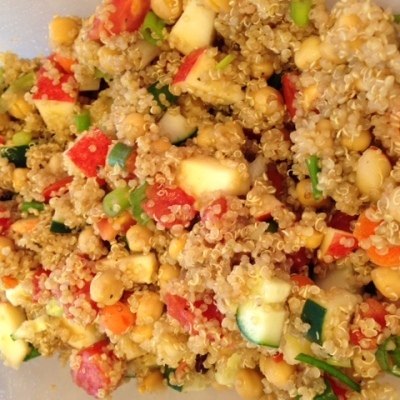 To cooled quinoa, add chopped veggies, feta cheese, and dressing. Mix well. Makes about 5 servings. Separate into individual containers and put in fridge for meals throughout the week. Add protein: diced cooked chicken, cooked salad shrimp, nuts, canned light tuna or salmon to this salad for a complete nutritious meal. Enjoy!